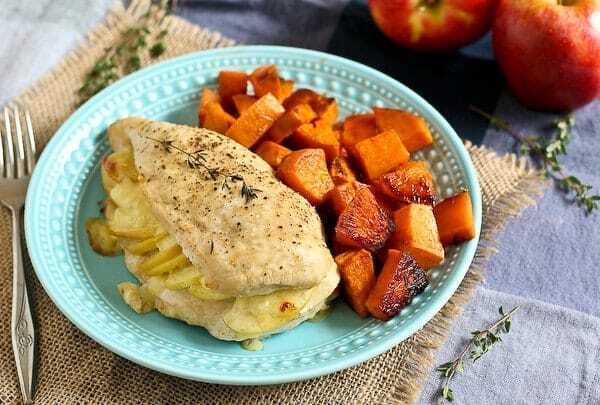 Creamy Gouda cheese and sweet apples make these stuffed chicken breasts a winning recipe! Pair with smoky roasted sweet potatoes for a sheet pan supper that will make everyone happy. This post is brought to you by Milk Means More. I seriously feel like my head is spinning! I wish I had a better eye for these type of things but truthfully, I have a hard enough time putting an outfit together or picking out a throw pillow…an entire bathroom is practically impossible. Thankfully, we have very patient contractors. Who I pay with apple gouda stuffed chicken breasts. And money. Lots of money. I wish I were only paying them in chicken. Wouldn’t that be a dream? I was testing this recipe on a day that Ben had a late night at work so instead of letting this chicken go to waste, I tested it out on our contractors. Thankfully they didn’t think I was too weird when I gave them one beautifully composed plate and then another that was far less pretty with a chunk of the chicken cut off (I had to try it myself, too!). And then I compounded the weirdness by asking 20 questions about the flavor combinations when they were finished eating. stuffed chicken + sheet pan dinner. Stuffed chicken, first. EASY. Looks fancy. Win win. Everyone thinks you’ve created this show-stopping chicken recipe. And you were able to do it with very little effort. What could be better? The sweet apple pairs perfectly with the creamy Gouda cheese. The sweet potatoes not only add a great pop of color, but thanks to the smoked paprika, they add a fantastic smoky element that gives depth to the entire meal. PS: Next time, should we add bacon? I think so. Watch the video to see step=by-step how to make these stuffed chicken breasts! Spray a large baking dish or sheet pan with nonstick cooking spray. Split each chicken breast across but not through and open like a book (be careful, you can easily cut yourself doing this!). This is also known as butterflying. On one side of the chicken, lay out 7-8 thin apple slices followed by 4-5 slices of cheese. Sprinkle with 1/2 teaspoon fresh thyme. Fold over and drizzle with 1/2 teaspoon olive oil. Sprinkle with 1/4 teaspoon salt and 1/4 teaspoon pepper. Place the chicken breast on sheet pan and top with another sprig of fresh thyme if desired. In a bowl, mix diced sweet potatoes with olive oil, smoked paprika, 1 teaspoon thyme leaves and sea salt until evenly coated. 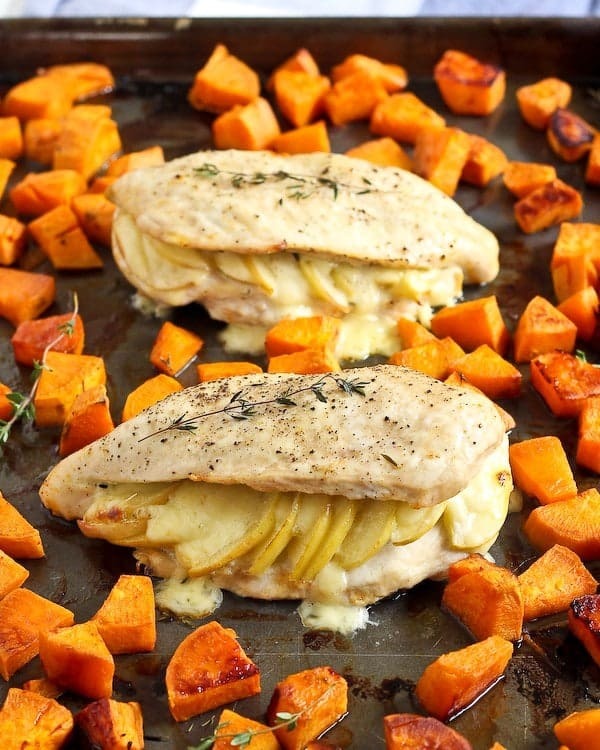 Arrange sweet potatoes in a single layer around chicken breasts. Bake for 20 minutes and then stir sweet potatoes. Continue to bake until the juices run clear from chicken and internal temperature of chicken registers at 165 degrees, about 10 additional minutes. Sweet potatoes should be fork tender. Verdict: So good! The flavors work together so well – I love that chicken is a blank canvas just waiting for fun flavors. Husband’s take: We’ll have to do another round of this recipe for Ben. The contractors left me empty plates so I’d say that’s approval! Changes I would make: None are necessary but I can’t get bacon out of my mind. More stuffed chicken breasts for you! This recipe didn’t come out as good as I thought it would. The chicken was bland, I barely tasted the apples and cheese, I added bacon but that didn’t help, and the sweet potatoes tasted a little off with paprika and salt. It was a weird, bland combination of flavors. Will not remake. Sorry to hear that…so many folks love this one! Made this for my husband tonight. Told me I need to make this again! I have a son who is celiac. This would be perfect for him! Thanks again! Oh that makes me so happy! So glad you liked these – thanks for taking the time to come back and leave a comment! I appreciated the concept of using only one pan—it allowed some of the flavours from the sweet potato marinade to run into the chicken. But unfortunately, the chicken itself was very bland. I was skeptical that the chicken wasn’t seasoned overnight, or brined, or marinated, but I figured that the gouda should transfer enough flavour. It didn’t.This recipes wasn’t inedible, but it wasn’t delicious either. But because I like the concept, I think I’ll try it again with a stronger cheese, a marinade or brine, and a bolder type of apple—or a very bold pear. Hi,I made the chicken breast alone. I sauteed two slices of bacon and then sauteed 2 tablespoons of minced shallots. I crumbled the bacon and shallots and added them to the filling. I thought the flavor was pretty good, though next time I think I’ll try a half teaspoon of thyme and back off the shallots to a tablespoon.Cooking time was another matter. Chicken breasts are pretty easy to overcook. If I had checked the temperature of the breasts at 20 minutes, I might have been okay, but I waited until 30 minutes. The breasts were then 189 F and dry. My oven is pretty accurate. The recipe might be modified to check the chicken earlier. This would save cooks whose ovens may be over temperature. 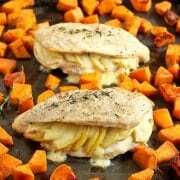 I often wrap chicken breasts in parchment and cook them at 400 F, an approach I found on a Kitchn website. Serious Eats has an interesting discussion regarding the safety of cooking plain chicken breasts to 140 F. Given this, another angle I’m considering is cooking stuffed breasts sous vide. America’s Test Kitchen has a more involved procedure for creating sturdy chicken breast wraps secured with twine that I might try. The first step would be sous vide cooking, followed by skillet browning. The size of chicken breasts varies greatly, so it’s possible you had smaller cuts than I did. I made this for my picky-eater husband and we both loved it! It’s easy, the flavors are perfect, and it’s filling. I made quinoa as well, but it was totally unnecessary. This recipe is fast to assemble and cooks up easily. So glad to hear you liked this recipe! Thanks for taking the time to come back and leave a comment – it means so much to me! 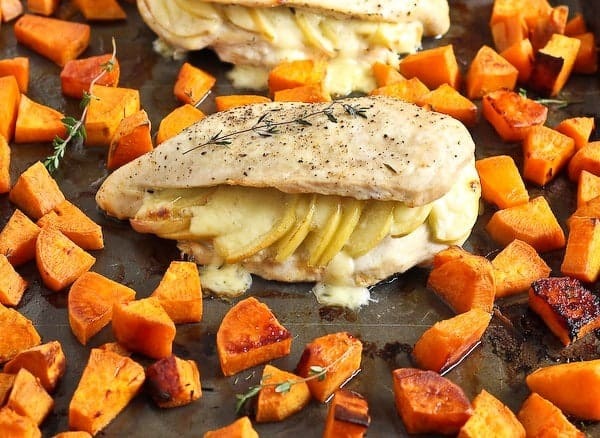 Just made this – the sweet potatoes needed around 40 minutes and I’m not sure if my chicken breasts were too small but they were very dry after cooking the same amount of time. If I were to make again, I would put the potatoes in about 10 minutes before the chicken and perhaps make a bit of a sauce for them because of how dry they were. Flavours were great though! Making this tonight. So excited to try it. Made it pretty close to the recipe, but also added some crumbled gorgonzola to the gouda and apples for an extra strength in flavor. Excited to see how it turns out. :) Thank you for the recipe!!! I hope you loved it! I bet it was great with gorgonzola! It was so good! I cooked it in a dish by itself and made a tray of butternut squash fries to go with it. Will definitely make again! PS: I looooove butternut squash fries! Do you get the ones from Trader Joes? I roast them with cinnamon, salt, and a little cayenne – so good! Actually, I cut up and made my own. I just like salt and a little pepper on them. I love their flavor (I am a big fan of everything squash tho). Planning to make this chicken again this week. Perfect! So glad you like it enough to make it again! Haven’t made the recipe yet but definitely want to try. If I can’t find Gouda, is there an acceptable replacement cheese? Also, can I use rosemary instead of thyme? Not really a fan of thyme and have a rosemary plant in my garden that I hardly ever use so always looking for an excuse. Lol. Cheddar would be good, or Muenster. Havarti might be yummy too! I think rosemary would be good on this — just in a small amount as it tends to overpower dishes. (I never use the rosemary in my garden, either!) I hope you love this recipe! Trying it tonight and will let you know! I was able to find Gouda at a different store from my usual. $4.50 and I’m going to have to find recipes to use it all. Maybe you’ll end up making this recipe multiple times. ;) Gouda is great on sandwiches too! Probably! I wanna make it again but use more cheese. And I think you’re right, this would be good with bacon in it. Did not make this recipe YET because I have to go,shopping for the ingredients. But I can’t wait to make it.. it sounds easy and delicious and that’s my kind of cooking. I will make one as is, and one w bacon or pancetta. I’m not crazy about apsweet potatoes but the color added to the plate. I’m thinking croasted carrots instead. Thanks for simple and elegant idea! I hope you love it as much as we do! I think carrots would be fantastic! They’re so good roasted. Absolutely delish! Made it just to the recipe. Hi Kristine! So glad you liked it! Thanks for taking the time to leave feedback! Is there another seaon I can use besides Thyme? I do not know what it is about Thyme that I dislike so much. If you like sage, I think a touch of sage would be great with the apples and cheese! Or you can skip it and use more smoked paprika. This was phenomenal! I marinated the chicken in oil and vinegar (I use Paul Newman’s dressing) and pounded them thin so I could roll the chicken. Boar’s Head smoked Gouda for the win along with Granny Smith apples. Other than that I didn’t add anything other than salt and pepper. The sweet potatoes were fantastic too! Thanks for the great recipe! I was super excited about this because I love Gouda . Made it as directed except used regular baking potatoes since we didn’t have any sweet potatoes. The regular potatoes tasted great too! The dinner was OK. I even told my husband I was surprised how plain it seemed even with the flavors of the Gouda and the thyme. It needed something else to jazz it up. I made it tonight. Mind you, we are having a problem with our oven so it’s not to accurate temperature wise. Mom liked hers with the apple. We used chicken breasts that had a small bone on the bottom but I did manage to butterfly them and if I do say so myself, they looked really nice when I was done. We did the bacon but it didn’t cook all the way, Next time we will cook the bacon before hand. The chicken was good but it was a little dry. It’s probably due to our oven not being the right temperature. We didn’t have any non stick cooking spray so I poured veg oil all over the cookie sheet so nothing would stick but the potatoes still stuck. We used all Yukon Gold potatoes and mom liked how crispy they got. They were very good. We had roasted baby carrots with the potatoes but for some reason they didn’t cook all the way. Probably our oven again. Mom says she is going to call our appliance repair man to have the oven fixed so I will make this one again when the oven is correct. Thanks for the great recipe! I am not a fan of apples but mom is. However, I am a huge fan of gouda (I love the smoky gouda) and bacon. Mom’s will have apple, mine will have cheese and bacon. Mom loves sweet potatoes, I don’t. On the sheet pan we can have one side sweet potatoes, one side Yukon Gold. My mouth is watering already! Oh wait! If I added a ham slice to mine along with the cheese and bacon that would kick mine up a notch, wouldn’t it? Okay, I know what were having for supper either tonight or tomorrow. Thank you for this really yummy recipe. Wait, I just thought of something else. We could have green beans along with the potatoes too! Okay, I need to go eat breakfast soon because I am making myself so hungry! Yeah, for one pan suppers! Sounds like a great plan! I hope you loved it! LOVE the pairing of Gouda with apples! Perfect with chicken! Cannot wait to give it a try. My new go-to meal. Everyone loves it! I roasted Yukon and sweet potatoes for those picky eaters. I have several breasts stuffed and in the freezer ready to go. Thanks for an easy yummy recipe. So smart to freeze a couple! Thank you for coming back with your feedback. So glad you liked them! 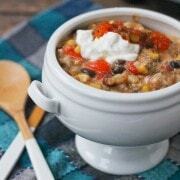 could you do this in a crockpot? how would you modify? I’ve never cooked this in the crockpot and frankly, I don’t think it would turn out too well. Luckily it cooks very quickly in the oven — it’s quite easy to make! Making this tonight! I can’t wait to try it! Someone gave us a huge box of apples so I’m finding lots of apple recipies! YUM! Ok, I’m trying this tonight. Should I add the bacon to the chicken or the sweet potatoes? People have had great luck adding it to the chicken! Could you use butternut squash instead of potatoes? As a former German, I couldn’t be more stoked to see this recipe. My parents bring suitcases full of Dutch Gouda every time they visit and in between, we stock up at Costco. Wouldn’t want to live in a world without Gouda. Or bacon for that matter. Now some avocado on the side and some chocolate mousse for dessert. I love that! Loving the side ideas too. Cooked these tonight and absolutely loved the flavors working together. But found that my chicken seemed over cooked. To the point that I scooped out of the filling and just filled up on the sweet potatoes. Any suggestions? Because really the flavors here were so great and sophisticated. I would just watch the temperature and if it seems to be overcooking, reduce the cooking time. 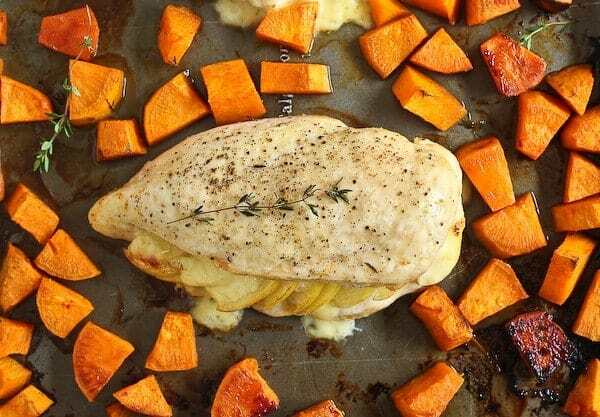 If you feel like the sweet potatoes won’t get done in that time, you can cut them smaller or give them a head start and add the chicken partway through the cooking. Cooking time really depends on size of the chicken breasts so that could be why yours dried out. Thanks for leaving a comment! Hi! Just wondering what kind of greens and vinaigrette/dressing you would recommend using with this dish? Thanks! I would just do a simple green salad with whatever greens and vegetables you have on hand. I love this dressing: https://www.rachelcooks.com/2015/07/15/sweet-and-tangy-honey-mustard-vinaigrette/. 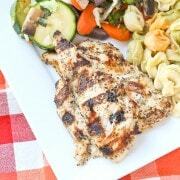 It’s tangy and flavorful and would be great with this chicken. Could this dish be made ahead (partial, frozen), etc or best fresh? This one will be best freshly made. I have already made this twice and we love it!! I add the other half of the apple and some small onions to the mix and it is so so good! I have also sprinkled a dash or two of nutmeg and cinnamon on top and it really highlights the fall vibe of this meal. So glad you like it! I love your adaptations — can’t wait to try it that way! I’m all about the fall vibes right now. OMG this was so delicious! I added a slice of cooked bacon to each breast and then breaded it with panko crumbs sprinkled some paprika on top it was fabulous! A keeper! Oh my goodness, I made this last night and can not WAIT for the leftovers for dinner this evening! 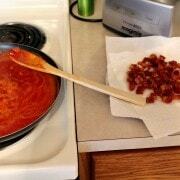 I took your bacon suggestion and added some pancetta…sooooo yummy. Thank you for the recipe!!!!! Thank you so much for this recipe! It wowed my MIL (that’s saying a lot!) and my boyfriend ran out of his office to tell me how amazing it was. I did cook some maple bacon and stuffed it after they cooked and made asparagus in the same pan intead of sweet potato. I will definitely be making this again! Do you think Granny Smith apples would work? We like a more tart apple. Granny Smith would be perfect for this recipe! This was so, so good! The potatoes came out creamy, almost mashable, which I wasn’t expecting, but they were great. And I did a horrible job of butterflying the chicken, but it still worked. I’m already imagining a dozen variations to try. Thanks so much for this great recipe. Yay! I’m so glad you liked them! Thanks for taking the time to come back and share your thoughts, Stephanie. It means the world to me! PS: Butterflying is so tricky! Mine aren’t always pretty either. I cooked this today for my co-workers and the chicken was very bland. Sorry to hear you didn’t love the recipe! It definitely has more subtle flavors than some of my other recipes but not everyone likes strong flavors. You might prefer these stuffed chicken breasts or this slow cooker chicken. This looks great! Would you cook bacon before stuffing the chicken? Should be fine raw :) the chicken has to cook through so the bacon should cook fine as well. Omg! I just made this! I admit at first I was skeptical about apples, Gouda, and, chicken… But this is absolutely AMAZING! I’m obsessed!!! Absolutely obsessed! And while it cooked, I cut up some extra apple and sweet potatoe and cooked it down for our 9 month old boy! Such and easy and delicious dish!!! Thank you so much! This looks delicious! I will have to try it. One question though – After cooking these for a half hour in the oven doesn’t the cheese kind of melt and disappear from inside the chicken? Some of the cheese will run out, yes (you can see that happening a bit in the photos), but much will remain inside. If you’d prefer, you could lay a slice on top in the last couple minutes of cooking. I really want to try these. Could these be wrapped in foil and grilled ? Looks delicious! I haven’t tested them that way but I think they would work! You’d want to make sure to spray the inside of the foil really well to prevent sticking. Looking forward to making this for dinner! The boyfriend doesn’t like sweet potatoes though. Any thoughts on other sides that would compliment this dish? Preferably a starch and a green? Thanks! Hope you guys love it! Regular potatoes would be great with the same seasoning on them and would roast in the same way as the sweet potatoes. It would be great with a green salad or you could throw some asparagus on the sheet pan with everything else in the last ten minutes of baking. Thank you for the suggestions! I was about to ask the same question since my 2 year old loves Gouda and green apples but won’t touch sweet potatoes. I might need to try it both with regular potatoes and the asparagus. I dipped my gouda and apple stuffed chicken in flour, then egg, then panko. Made it super moist and added a very yummy crunch!! This dish was a major success…..so excited to prepare it for guests. I added some balsamic vinegar to it towards the end…..will continue to do so. Oooh balsamic is a great addition! Thanks for taking the time to come back and leave a comment! I just made this tonight and am in love! I had actually never had Gouda cheese before if you can believe it… But I am so converted! I did make this for one as I am a college student and live alone… All I had to do was half the recipe and cook it in a smaller pan though! Other changes I made were to add rosemary instead of thyme, cook the other half of my apple with the potatoes, and add a green salad to the side. Wow! This was so fantastically delicious that words escape me! You were right about the paprika, and the smoky flavor it adds to the dish! I am so ready to make this for my family next time I see them! Thanks a million for the recipe! So glad you liked it! I definitely need to try it again with bacon. Thanks for taking the time to come back and comment! Means the world to me! Made this for my husband on Saturday, and it was a HIT! We often roast sweet potatoes, but in sticks. He actually liked the smaller chunks better. Thanks Rachel! I’m so glad you liked it! Thanks for taking the time to comment! Thanks Gina! I agree – one pan dinners are THE way to go! I made this tonight (with turkey bacon) and it was delicious! Thanks for the recipe! Three cheers for bacon! I’m so glad you made it and liked it – thank you so much for taking the time to leave a comment! What a super lovely dish – I love the entire presentation, the ease, and the combination of flavors! Stuffed chicken breasts are always the fancier dinners here. LOVE how easy this one is. Gouda is crazy good and fantastic with apples! Yum, Gouda makes everything delicious! I’m envious of your bathroom remodel our MB is about the size of a closet. Best of luck and patience!